CHARLOTTESVILLE, Va. -- The driver charged with killing a woman protesting a white supremacist rally in Charlottesville was previously accused of beating his mother and threatening her with a knife, according to police records released Monday. 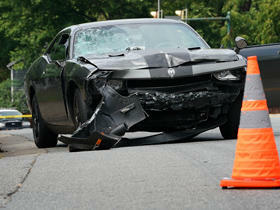 Authorities say 20-year-old Fields drove his silver Dodge Challenger into a crowd of counter-protesters Saturday in Charlottesville in an act of domestic terrorism. Nineteen people were wounded in addition to the woman killed, 32-year-old Heather Heyer. A Virginia State Police helicopter deployed in a large-scale police response to the violence then crashed into the woods outside of town and both troopers on board died. Friend of Charlottesville victim says Heather Heyer "died for peace"
The records the Florence Police Department in Kentucky show the man's mother had called police in 2011. Records show Fields' mother told police he stood behind her wielding a 12-inch knife. Records show that Fields was arrested and put in juvenile detention. Bloom told the AP late Saturday that she knew her son was going to Virginia from Ohio for a political rally Saturday, but she had no idea it involved white supremacists. Sources tell CBS News' Andres Triay and Pat Milton that FBI and DOJ investigators will examine any possible connections or communications Fields may have had with others before he allegedly drove his car into the crowd. Investigators are delving into his background, possible affiliations with groups espousing violence, any social media postings as well any electronic communications he may have had. Officials will also trace his path to Virginia from his home in Ohio, particularly the 24 hours prior to the attack, the sources said. Fields was fascinated with Nazism, idolized Adolf Hitler, and had been singled out in the 9th grade by officials at the Randall K. Cooper high school in Union, Kentucky, for his "deeply held, radical" convictions on race, his former high school teacher Derek Weimer said Sunday. Fields later enlisted in the Army and reported for basic training in 2015 but was released from active duty four months later because of what military described only as "a failure to meet training standards." Fields had been photographed hours before Saturday's attack with a shield bearing the emblem of Vanguard America, one of the hate groups that took part in the "take America back" campaign to protest the removal of the Confederate statue. The group on Sunday denied any association with the suspect. Charlottesville Police Chief Al Thomas told a news conference Monday that a hotline was being set up to enable people to report assaults and other criminal activity that may have occurred at Saturday's rally. He also said "alt-right" rally attendees had failed to follow an agreed-upon plan on entering Emancipation Park. The attendees were gathering to protest plans to remove a Confederate statue. President Trump condemns hate groups as "repugnant"
The event also drew counter-protesters -- and Thomas said the crowds became more aggressive and "mutually engaged combatants" became more violent. When asked whether he had any regrets, he said: "Absolutely I have regrets. We lost three lives this weekend." The mayor of Charlottesville, political leaders of all political stripes and activists and community organizers around the country planned rallies, vigils and education campaigns to combat the hate groups. They also urged President Trump to forcefully denounce the organizations, some of which specifically cited Mr. Trump's election after a campaign of racially charged rhetoric as validation of their beliefs. Mr. Trump's initial failure on Saturday to denounce the groups by name, and his blaming of the violence on "many sides," prompted criticism from fellow Republicans as well as Democrats. Under pressure to speak out more forcefully, Mr. Trump condemned Ku Klux Klan members, neo-Nazis and white supremacists who take part in violence as "criminals and thugs" and declared that "racism is evil." Fields appeared in court via video monitor Monday and was denied bond after the public defender's office said it couldn't represent him and the judge was forced to find a local attorney to fill in.